Long and stringy, chewy or delicate, stuffed or hollow: In all its configurations, the humble noodle is a primary food source for billions of people, but its origins have been obscured by the mists of time. The Italians claim they created the noodle as the perfect complement for tomato sauces; the Chinese say the Italians got it from them, via Marco Polo; Arabs claim its creation as an easily stored foodstuff suitable for long treks in the desert. The Japanese, Koreans, French and even the Germans have also claimed the noodle as their own. Chinese researchers may have finally settled the contentious question after unearthing a 4,000 year-old container of noodles in northwestern China, according to a report in today's issue of the jurnal Nature. 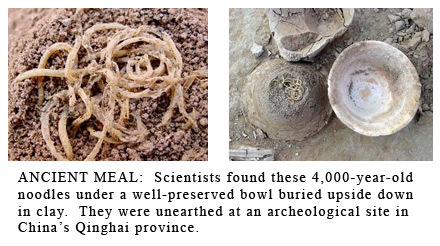 The easily recognizable noodles are far older than any that have previously been discovered and predate the first written mention of noodles by at least 2,000 years, said archeologist Houyuan Lu of the Chinese Academy of Sciences of Beijing, who led the team. "I can't imagine a more conclusive piece of evidence than this," said Ming Tsai, a celebrated Chinese fusion chef who owns the Blue Ginger restaurant in Wellesley, Mass." "This find definitely proves that the Chinese were making noodles way before the Italian Marco Polo came," said television chef Martin Yan. "I take pride in that, even though I have a lot of Italian friends." Archeologists have found other foods from the deep past - the dregs of 9,000 year-old wine in China and hearths for bread making in the Middle East 23,000 years ago. The noodles are the oldest prepared food found in tact. "You often hear about ingredients being found, whether it is corn or ancient grains, but it is not too often that you hear about something as complex as noodles," said Greg Drecscher, senior director of the Culinary Institute of America at Greystone in Napa Valley. The ancient noodles are delicate, about 20 inches long, and yellow. They were made from millet. Although the ancient noodles were similar in shape to their modern counterparts, their composition was quite different. Most noodles today are made from wheat or rice, but the Chinese noodles were made from millet, a type of cereal grass that has been cultivated in the country more than 7,000 years and that is still a mainstay of the diet in arid regions of the north. That discovery confirms work by archaeologist Gary Crawford of the University of Toronto at Mississauga, whose efforts at other Chinese sites dating from the same period also show a high reliance on millet. That may explain, he said, why archeologists often find no grain seeds at some sites: The grains were crushed into flour and made into noodles. 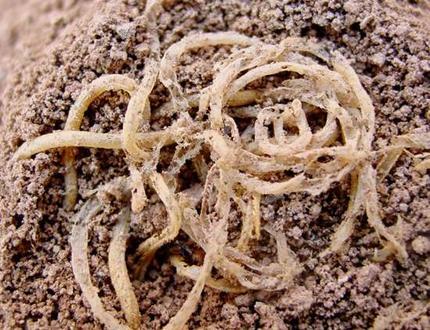 The noodles, were discovered in the excavation of the site known as Lajia on the upper reaches of the Yellow River in Qinghai province. Lu's team has been digging there for several years and has found the remains of a Neolithic village. The excavations have revealed the remains of may houses containing human skeletons, porrery, stone and jade artifacts, and animal bones. Lu said in an e-mail message. The condition of the artifacts suggests that the region suffered a major earthquake, followed by flooding that buried the village relatively intact. Earlier this year, Lu said the team found a well-preserved bowl buried upside down in a fine, brownish-yellow clay. When they removed the bowl, the lid remained behind, buried in a cone of silt. Lying on top of the cone was a fist-sized mas of noodles. "Apparently, an empty space existed between the bottom of the bowl and the top of the infilled sediment cone, preventing the noodles from being crushed by the weight of thesediment." Lu said. "The empty space must have become tightly sealed and (oxygen-free), allowing excellent preservation for 4,000 years." The noodles are delicate, about 20 inches long, and yellow. They resemble noodles called la mian, shich are made by repeatedly stretching the dough by hand. Examining starch grains and mineral deposits called phytoliths in the noodles, the team determined that they had been prepared from millet, a tough plant that grows well in hot, dry climates. The finding lends credence to the belief that early civilization in that region was supported by the domestication of millet, and that the use of other grains arose much later in Chinese history, Lu said. Tsai doesn't think it would have taken a technological breakthrough to produce the first noodle. "It's two ingredients, flour and water," he said. They discovered the grain, and they knew they could grind it. They figured out that when you ate the flour directly, it was nasty. Any cook with any sense would say, "Let's mix it with something." Then someone figured that if they cooked it, it would be edible. 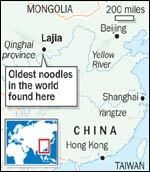 Not everyone agrees that this is proof the Chinese invented noodles. Lynne Rossetto Kasper, host of the public radio show the Splendid Table, thinks they were probably invented many times by many people. "I think the noodle has been a solution for people, in one form or another, over much of the world," she said. So, does it matter, ultimately, who invented noodles? "No", Kasper said. "What does matter is that they exist, and they've existed as a way of preserving nourishment for a very, very long time. That I find exciting."